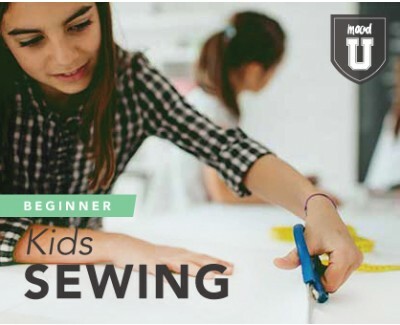 The Mood U 6-Week Beginner Sewing Course for Children (ages 8-15) is a set of six (6) consecutive weekly in-store classes designed to teach the fundamentals of sewing by creating a simple bag from start to finish! Students will learn basic home-sewing machine operating skills, pattern layout, fabric cutting, sewing construction, and finishing techniques. This class is a perfect opportunity for children to realize their sewing dreams and enjoy the creative process. The first sewing project is our popular Mood U Tote Bag. Each week we focus on a different stage of the project, and by the end of the 6-week session students will have completed their own customized Mood U Tote Bag from start to finish. From this single project you will have built a solid foundation of sewing skills and techniques to prepare you for our intermediate sewing class for children where you will learn the basics of garment construction. PLEASE NOTE: To attend the Mood U 6-Week Beginner Sewing Course for Kids with FREE tuition, you will need to purchase the complete Mood U Sewing Kit; a well-rounded selection of quality sewing tools to get you started on your creative journey. Each item in the kit has been carefully selected and will be used at various stages of your Mood U Tote Bag project. You can purchase this kit in-store anytime during regular store hours up to the first day of your scheduled class for $140.00 incl. tax. All of the items in the Mood U Sewing Kit can be used for our Mood U 6-Week Intermediate Sewing Course for Children, as well as many of our workshops.